Computer Screens: The Bigger The Better? With less paper in the office, many of us find that we do a lot of reading and work on our computers. Do larger screens or several monitors make it any easier? The consensus seems to be “yes”. 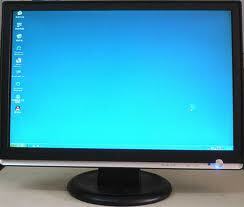 Once you try two monitors, there’s no going back, according to Dave Kinsey, president of Total Networks. Several studies show that, with two monitors, tasks are completed more quickly with fewer errors compared to using one monitor. How nice to have several screens open at one time without having to switch back and forth! If two monitors are great, why not five or six? Kinsey cites a paperless law office that does just this. The six monitors are open to calendars, email, the company’s practice management program, documents, a screen for another application and the two end screens in landscape which are perfect for spreadsheets. The monitors cover a lot of screen real estate. When you can read two documents side by side, the need to print out or keep paper is almost completely eliminated. While I was mulling over the idea of how many monitors would fit on my desk, I came upon an article posted in The Lawyerist suggesting one BIG screen. Todd Hendrickson posits in his article “In a Paperless Office, A Bigger Monitor is Better” that a jumbo monitor (27” or larger) is better than multi-monitors if you spend most of your time reading and writing. The key advantage? You can see several full-page desktop views with minimal scrolling. All it takes is a few keyboard shortcuts. In essence, it can do the same thing as multi-monitors and still leave room on your desk. For more details, check out http://lawyerist.com/in-a-paperless-office-a-bigger-monitor-is-better/. What’s On The Top Of Your Desk? Keep only the essentials on the top of your desk within arm’s reach to help you stay organized and efficiently manage your work day. Other items scattered on your work space can get in the way, literally and figuratively. Papers, business cards, coffee cups and dozens of pens scattered about can easily distract you from the task at hand. And when it is hard to focus, it’s much more difficult to achieve your personal best. In any discussion of desk surfaces, clients typically inquire about their personal items such as framed photos and other decorative objects. Our recommendation: limit personal items to two or three things that remind you why you come to work in the morning and why you leave in the evening. Rotate these items regularly to keep things fresh and interesting. Schedule time in your planner to organize your desk. You’ll be glad that you did. If you have put off taxes, and many people have, there is still time to buckle down and finish them before April 15th. Asking for an extension just prolongs the misery and weighs you down. You know they need to be done so why not just get on with it? Now. There is no more time left to procrastinate. 1) Set up a date to meet with your accountant, if you use one. 2) Schedule time on your calendar to work on your taxes (and only your taxes in this allotted time). Be sure to keep the appointments. 3) If your accountant has given you a worksheet, read it through carefully it so you know exactly what is needed. 4) Pull out all of your papers and divide them into categories. Print the documents that are on the computer or copy them onto a USB or CD for the accountant. 5) Sort the papers again, this time into subcategories. For example, you might begin with a stack labeled clients and gradually whittle it down to a number of individual clients. 6) Write down your questions so you do not forget to ask themyour accountant or a knowledgeable source. 7) Call for the documents that are missing. 8) Label each stack of documents, using binder clips to separate them. While all of these stacks may not be needed for the accountant or the IRS, it helps to stack them in an organized pile. 9) Put in as much energy and time as needed to finish the job on time. Forego weekends and week nights, if that is what it takes. 10) Make sure the government office signs a receipt and returns it to you. Keep the receipt in your tax file. If the IRS later on says that they never received your taxes, you have the proof that they were sent. This happens more than you may realize. Now sit back and relax while your friends and colleagues scurry around in panic mode trying to meet their extension dates because they put their taxes off. And you didn’t! If you have recently organized your office, you know the type of work it takes to accomplish this feat. Are congratulations in order? Most definitely yes! And what a wonderful feeling! At long last you can put your hands on a document quickly without wasting time searching. The clutter is gone, old files have gone to storage, current files are in a nearby drawer, binders on the credenza are labeled and the sole project on your desk is the one you are working on currently. And here’s another plus: You can invite clients and co-workers without feeling embarrassed by the appearance of your space. The message is loud and clear that your office is totally functional and you are in control. Now can you cross that project off of your list? Well, yes, but not the part about maintaining the organization. Just because your office is in ship shade at the moment and you are able to be highly efficient, does not mean that the organization will stay that way on its own. Some people forget about the effort needed to keep your space clear. If you let it go, your office will be back to square one in no time at all. It will be messy and cluttered and will require all of your energy to navigate — energy you would prefer to put toward your job. Designate a time — daily or weekly — to put everything back in its place. You may need to spend 15 minutes at the end of the day or an hour every Friday afternoon. Then add it to your calendar and be sure and do it. Decide your tolerance level, that is, at what point do you stop to sort, file and make decisions on papers that have no home. Maybe it is when the inbox is full. Ask a co-worker to “shadow” you while you get your office back to its organized state. His/her presence in the room is sufficient reason for you to stay motivated until your work space in back in working order. Change organizational systems that are not working instead of struggling with them. Sometimes a system needs revamping even though you were sure it would work when you set it up. A perfect example is a tickler system. Your colleague raved about how well it works but not for you. You are clearly disappointed in the way it performs. 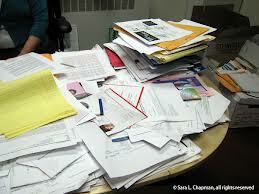 Instead of giving up and leaving the papers scattered about, try a different filing system. Keep trying different until you get to one you like and know you will use. These tips will go a long way toward maintaining your hard-earned organization. True, they will require effort but the benefits in productivity are well worth it. You’ll feel less stress because you are free to focus on your tasks. There is good news, however: It’s a lot easier to maintain systems and processes once they are established. It will take a lot less time to keep on top of papers, files and anything else that lands on your desk from here on in. — Magazines and catalogs I have no intention of reading. — Coupon flyers I have no intention of cashing. — Special offers from local retailers, land companies, real estate firms, etc. I have no intention of using. Would you like to reduce the pounds of junk mail that weigh you down? Would you like to open your mail box and find only first class mail? Below are opt-out websites that will help make this happen. 1) www.directmail.com — there is no cost to take you off lists. 2) www.dmachoice.org — choose particular companies in the following four categories from which you still want to receive mail; eliminate the rest for five years or permanently. 3) www.OptOutPrescreen.com — the official consumer credit reporting industry website for consumers to opt in or opt out of credit or insurance offers for five years or permanently. Most of us think of springtime as the perfect time to get rid of clutter in our homes. We envision coats bulging from the closet and drawers filled with things you don’t need any longer. But the same problem exists in many offices and home offices; piles of paper, files strewn about and random items taking over good real estate on the desk or credenza. If this describes your work area, here are a few ways to clear your space (and your head). 1) Are you honestly going to read those papers and magazines? If the answer is no, then give yourself permission to toss them out without feeling guilty. 2) If I change my mind after I’ve thrown out a paper, then what? In many companies the person who sent the document originally keeps a copy. Or, the information may be easy to pull up on the web. Then again it might be available through a professional group such as the local bar association. Clutter may not just be physical. It comes in other forms as well. How many times has a thought popped into your head and then disappears? No matter how often you push it aside, it keeps returning. Write it down. Often, you need to act on it. Once you add it to your to-do list or assign it to your calendar, then you no longer have to keep remembering it. The best part: your head is now clear to focus on important things. Clutter can also be technological. Your computer, smart phone, iPad or Kindle can be loaded down with documents and apps that you do not use. They’re in the way when you are searching, making it difficult to find what you are looking for. It prevents you from being creative and saps your energy and focus. Make the clutter disappear. It sounds easy enough but, unfortunately, will not happen without you taking action. Set aside time to deal with it, even though you prefer to be working on something else. It could easily take a few hours which you may want to do all at once or in small increments. As long as the time is blocked out on the calendar, you can feel confident that the job will get done. Before you know it you’ll be back in control of your desk and technology tools.